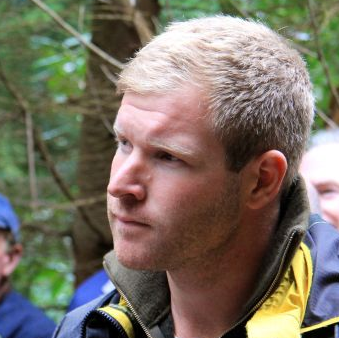 This is a detailed post written by my forester, Sean Hoskins (also a fellow New Zealander) who is on the committee of ProSilva Ireland. We both attended this forest day to hear how this wood is being managed using Close-to-Nature forest methods so it becomes a Continuous Cover forest. This is one of the most important ways I have learned about this new type of forest management over the last five years and all open forest days organised by ProSilva are led by international leading forest experts. This post first appeared on the ProSilva Ireland website. 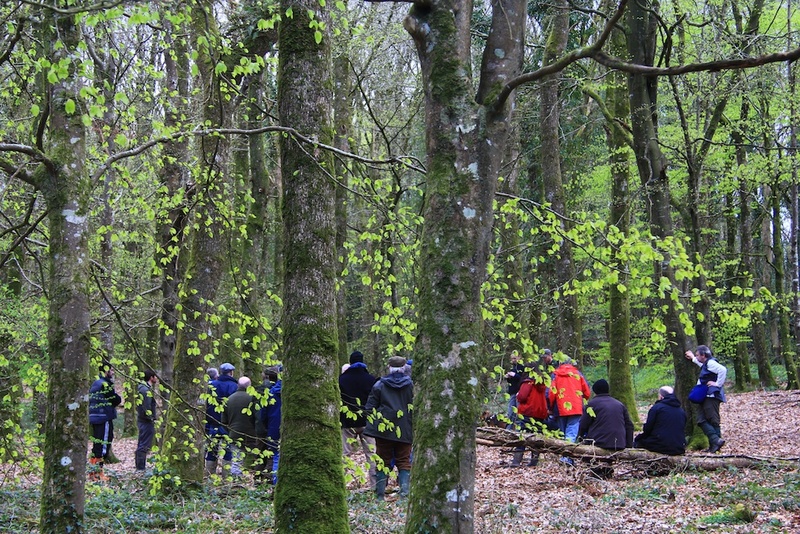 ONE of Coillte’s (Ireland’s semi-state forest organisation) oldest woods provided a living textbook for Close-to-Nature Continuous Cover forestry at Prosilva Ireland’s summer open forest day. Rahin Wood, near Edenderry, is a 70-hectare woodland of oak and beech planted in the 1935. The site includes second-generation Norway spruce planted in the early 1990s and plantation ash, as well as regeneration of ash throughout. 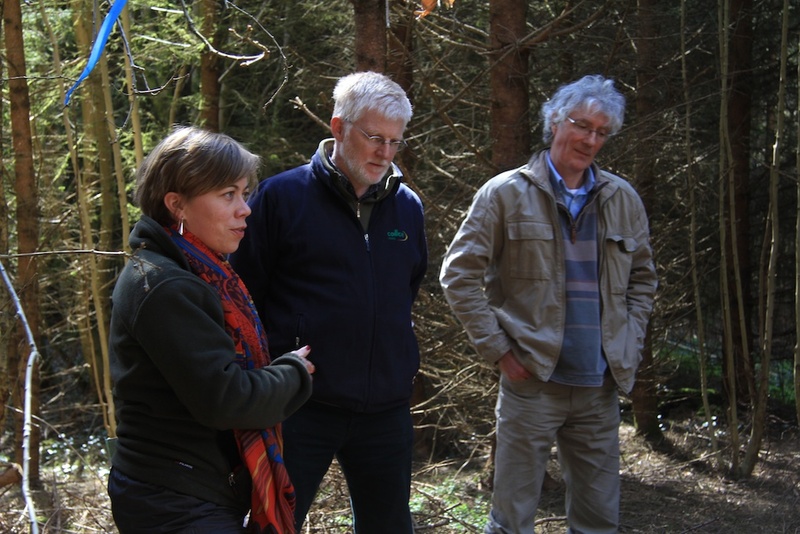 A group of 40 listened as ProSilva’s visiting foreign experts Sophie Bertin and Phil Morgan revealed the complex natural processes unfolding in the woodland and how they could be worked with and valued to produce a sustainable timber crop and other services. Phil Morgan, President of ProSilva Europe, explained how bioautomation could reduce the costs of managing the forest. Bio automation is the natural responses of the forest ecosystem to certain conditions. Phil explained how bioautomation could reduce the costs of managing the forest. Sometimes these bio automations can replace human interventions usually required to produce quality timber, thus saving money. 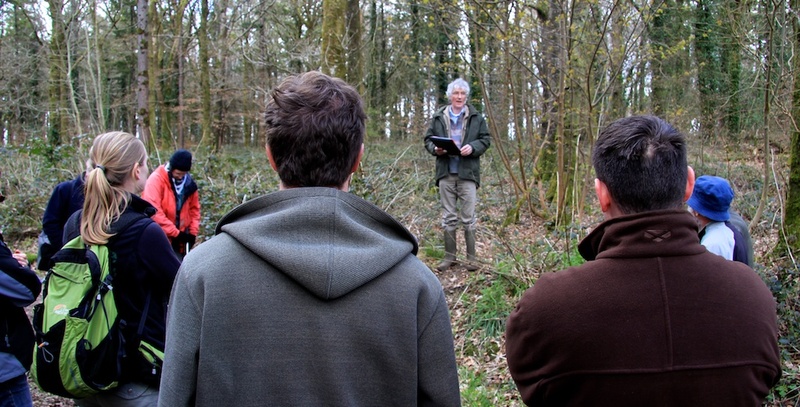 Pointing out an area with regenerating beech and canopy shading as an example, Phil explained how controlling light could be used to favour a desired species. 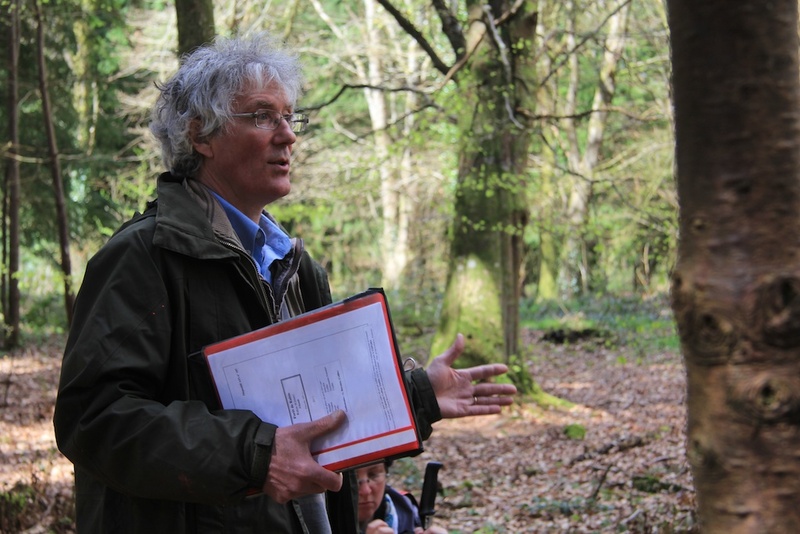 “We can control species to a degree through canopy control; beech tolerates shady conditions. This is the way you use the forest to determine structure and species,” he said. One of the group enquired about pruning in a continuous cover wood. Phil said if the operation could not be performed by nature and would improve the stand it must be done and that in the case of pruning the cost was relatively low so it was an ideal intervention to invest in. Sophie’s work as a forester saw her seeking to maximise forest owners’ returns while adding value to the stand. The beech stand was in need of thinning and Phil said the absence of brambles provided an indication of overstocking. “There is a lack of bramble and regeneration due to shading with little moving up into canopy,” he said. More light was needed to encourage regeneration but this had to be done in a measured way. He went on to point out another grouping of trees where a hole in the canopy had resulted in leaning and crooked beech struggling towards the light. Trees were drawn up to the canopy in even light but drawn to side if just holes, Phil said. “Creating holes is important but far more important is the basal area over whole area,” he said. The basal area measures the stocking of a stand, the actual square meterage of ground covered by tree, and leads on to volume per hectare calculation. Phil estimated the area currently had a 31m2 basal area per hectare whereas the AFI (see box) considers 28m2 an optimum basal area. “So hurry up and thin it, it’s overstocked…concentrate the increment on best stems,” he said. Poor stems needed to be removed first to increase the overall quality of the woodland. Both speakers emphasized the importance of establishing a good extraction infrastructure at the first thinning stage where permanent access racks would minimized the damage to forest and contain ground compaction in one area during each intervention. Looking down one of the ‘thinning racks’: Sophie made the point that volume of timber from felling the racks would also help to pay for the thinning operation. 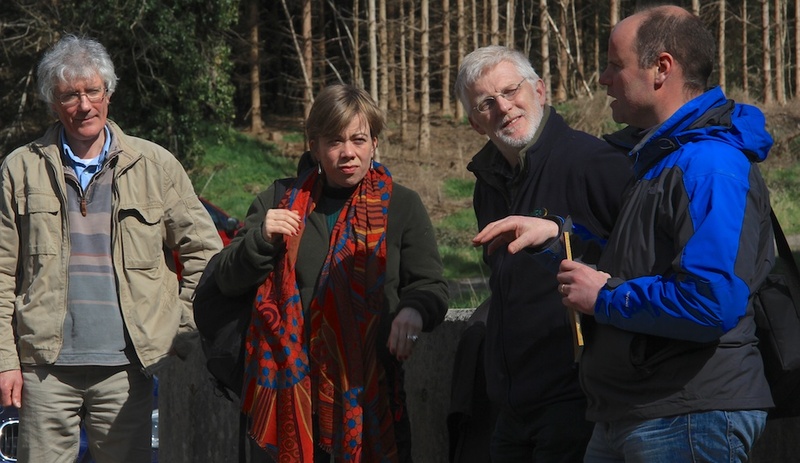 Phil Morgan explained that Rahin, as well as being a Coillte forest, was also AFI research site. “AFI is there to provide evidence of the benefits of ProSilva principles, which sometimes attract a level of criticism because it is more intuitive and doesn’t follow a set system,” he said. Part of the AFI program included regular monitoring of the site so the exact growth increments of a stand were known. Phil explained that the AFI monitors sites but doesn’t prescribe. All stands are measured and a financial record is keep as well as monitoring of biodiversity. Prosilva Ireland chair Padraig O’Tuama was involved in carrying out the AFI monitoring. “AFI will give us evidence that will build up over time from these selected woodlands to help our arguments,” he said. Sophie said she accessed the AFI database to find similar sites to those she was managing to enable her to forecast and plan for the future. The AFI database will shortly be freely online. “So if you have a douglas fir site you will be able to refer to AFI douglas fir sites that have been measured three or four times already and also see a commentary on what the forest did,” said Phil. The group moved on to a new plot featuring aggressive, self-seeded western hemlock amongst the hardwoods, where Phil said the question was whether or not the trees should be removed. Padraig said the Prosilva principle of mixed species stands was a consideration. “Alternative trees help stand resilience,” he said. An example of the dangers of monoculture forestry could be seen in the recent ash dieback outbreak. Phil said an option would be to use the western hemlock to control weeds through shade and then removed them when needed. “Use them rather than fight them, use them for benefit,” he said. The experts were asked for their opinions on bramble control. “When you make the transition to irregular forestry initially the process may require enrichment planting to create an understory…and you may have to control brambles,” Phil said. When transforming a conventional stand from the two-tiered structure of canopy and field to something more complex the full bio automation of a irregular stand was not yet established so more interventions would be needed in the transition period, he said. Rahin’s norway spruce stand provided an example of an even-aged plantation that could be transformed to continuous cover management. “We can initiate transformation at any stage but the optimal time to initiate it is the first thinning stage,” said Phil. Latvian forester Talis Kalnars prescribed irregularity at this stage and devised the graduated density thinning regime (See box) to keep stands stable while working with the Forestry Commission in the UK. Phil said the system had the benefits of reducing wind blow, producing an income and introducing irregularity. Sophia said serious storms in France which had resulted in wind blow and financial loss for forest owners had seen more stands shifted to irregular management principles for resilience and stability. The removal of subsidies for planting had also highlighted the benefits of a forest which regenerates itself. Sophia also spoke about the ecosystems services provided by woodlands; the natural processes that had direct benefits for man. A key example was the regulation and filtering of water. She had been involved in a project in France where a forest covered a catchment area for an urban drinking water supply. She said a survey of urban dwellers had shown most people were willing to pay a bit more for the quality water than for cheaper, chemically teated water. 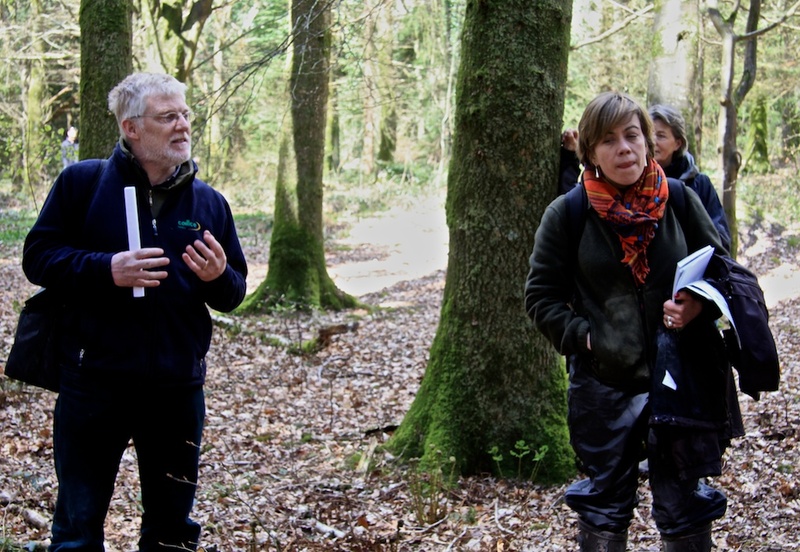 Forest consultant and ProSilva Ireland treasurer Paddy Purser said forests also regulated runoff quicker than non-forested areas and regulated climate and moisture and reduced the risk of drought. 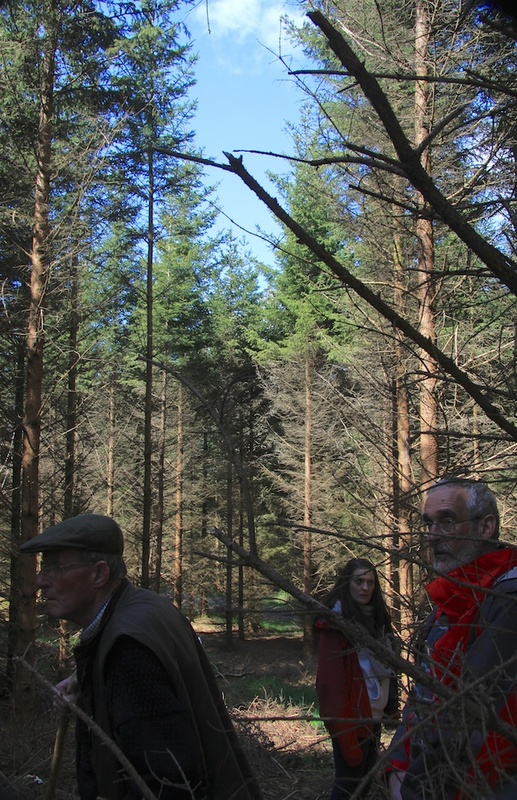 Clearfell forestry risked releasing nutrients and debris into water systems and catchment areas which would then require costly filtration and chemical treatment if used as a water supply. – The desired species can be favoured and encouraged through the control of light to the forest floor. For example, a shady floor will favour regenerating, shade-tolerant beech over more light-loving species like ash. – Save money, increase profits and reduce the impact of human intervention by letting bio-automation do the work. Natural processes can do commercially beneficial work that costs money in a conventional system. – Forest owners, foresters and contractors will soon be able to access a AFI database where they can find how different continuous cover management strategies impacted on sites similar to there own. – A mix of species makes for a resilient forest. The current ash dieback threat highlights the dangers of monoculture. – The optimal time to initiate transformation of a stand to continuous cover principles is during the first thinning. – Aim for a mosaic of light from dark to bright on the forest floor to bring on different species in regeneration. – Continuous cover management reduces the risk of wind blow and guards against financial loss and negative environmental impacts. In coniferous plantations undergoing transformation to continuous cover management Talis Kalnar’s graduated density thinning scheme can be used. The updated technique involves removing one in 8 racks and then thinning the racks in between at a graduated density of 30, 20, 10, 0, 10, 20, 30 percents. The spine of the area between racks thickens and stabilizes towards the 0 percent-thinned centre rack leading to a more stable stand. The 0 percent rack can then removed at a later thinning as a timber extraction route once the stand is stable. The system also has the effect of producing the desired mosaic of light. – When thinning remove big, poorly formed dominant trees to release quality trees from competition and to increase the volume and therefore profitability of the thinning operation. – Aim for high quality timber that will fetch top dollar at a harvestable age. This means owners need to be familiar with their forest and ensure tending and thinning is completed on time. If bio automation is unable to do the work and intervention must be made. – Value the free ecosystem services the forest provides such as water filtering in catchment areas and erosion control. – Look at other ways for the forest to pay its way. Sophie said in parts of France after the main income from timber woodlands also generate revenue from hunting leases and mushroom and berry picking. French forester Sophie Bertin is the founder and managing director of Ekolog, a company which provides consultancy, research and training to corporations and organisations on how their business practices impact, and are dependent upon, ecosystems. She advises on how they can incorporate these concerns into a responsible investment strategy and sustainable ecosystem management practices. He is a past chair of Prosilva Great Britain and also translated the AFI handbook on continuous cover management. The Association Futaie Irrégulière is an association registered by French law, setup in 1991 by a group of private forestry consultants in order to promote the management of irregular stands. It aims to share technical information and is founded on the principles advanced by Prosilva of Close-to-Nature, continuous cover forestry management. Although these two associations share many common objectives they both operate within their own separate spheres. NEW ZEALANDER Sean Hoskins, ProSilva Ireland committee member, is a former newspaper reporter and vineyard manager. He now lives in Co. Kilkenny and operates a small woodland contracting service focussing on close-to-nature, continuous cover forestry.